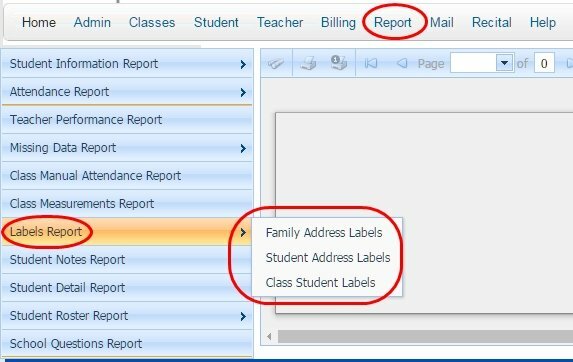 The Labels Report has three options to create mailing labels. All labels are formatted be print on the Avery 5160 1” × 2-5/8” Address labels that are 3 columns of 10 per sheet. The Family Address Labels will create a label for each entry in the Family Link page. These labels will be addressed to the student with the student address. The Class Labels will select all active classes with enrollment for the default season. It will list the class name, start-end time and day of class, and student name.